Background: Robert D. Rettmann interviewed Emilie O’Connor, then a licensed school social worker and full-time Positive Behavior Supports & Intervention External Coach for the Wauwatosa School District. I was fortunate to be asked to sit in and then turn the interview into a piece fit for the journal we publish! This journal goes out to our 30,000-and-counting Certified Instructors as part of their membership. You can also find Building a Better Behavioral Framework: Tiers of Positive School Support on our website. The following is reprinted with permission from the Journal of Safe Management of Disruptive and Assaultive Behavior, Fall 2012. ©2012 CPI. (Updated 2016). Emilie O’Connor understands the importance of distinguishing between what we can and cannot control. As Positive Behavioral Interventions and Supports (PBIS) coach and sole Certified Instructor for the Wauwatosa School District in Wisconsin, O’Connor has drawn on her prior experience as one of the district’s social workers to combine CPI methodology with the needs of each school to build positive relationships, increase behavioral and academic achievement, and decrease disciplinary issues overall. This misconception about CPI isn’t restricted to any one discipline; O’Connor’s classes include regular and special education teachers, psychologists, social workers, counselors, and PBIS coaches. Teamwork is an integral part of CPI training, and it’s essential that not only individual crisis response teams in each building, but all teams across the district, work together. This includes viewing the training not as a single one-and-done event, but as a framework or continuum of care for all to embrace. As such, O’Connor recognizes that behavior is culturally specific; methods that work at one school could be drastically different at another, especially given the rich range of diversity that Wauwatosa enjoys. Language makes a substantial difference as well. Using similar terms for strategies and approaches across the district reduces potential confusion and reinforces the idea that each nugget of training is an integral part of the evolving care framework. Educators used to hearing about—and dismissing—new strategies each year now recognize strategies belonging to the same continuum of care. It’s crucial, O’Connor said, that people don’t view the Nonviolent Crisis Intervention® program as a separate system from PBIS, adding as an example that “certain Nonviolent Crisis Intervention®techniques braid very well with PBIS.” One of her goals is to ensure that de-escalation and good classroom management strategies are a part of every workshop. In addition, many staff members find themselves revisiting strategies they’ve learned in other classes, such as general psychology. O’Connor keeps her training hands-on, reviewing and revisiting techniques, and guiding participants to talk about what works and what hasn’t worked to help everyone hone their crisis response plans. PBIS is a strategy that paves the way for successful teaching, while Nonviolent Crisis Intervention®training is an approach to preventing and responding to the behavioral needs of the individuals supported in the process (CPI, 2008). Though a Certified Instructor’s primary role is to teach Nonviolent Crisis Intervention® content, Instructors whose organizations support the PBIS framework have found that by integrating Nonviolent Crisis Intervention® training into PBIS strategies, positive change is more likely to occur. 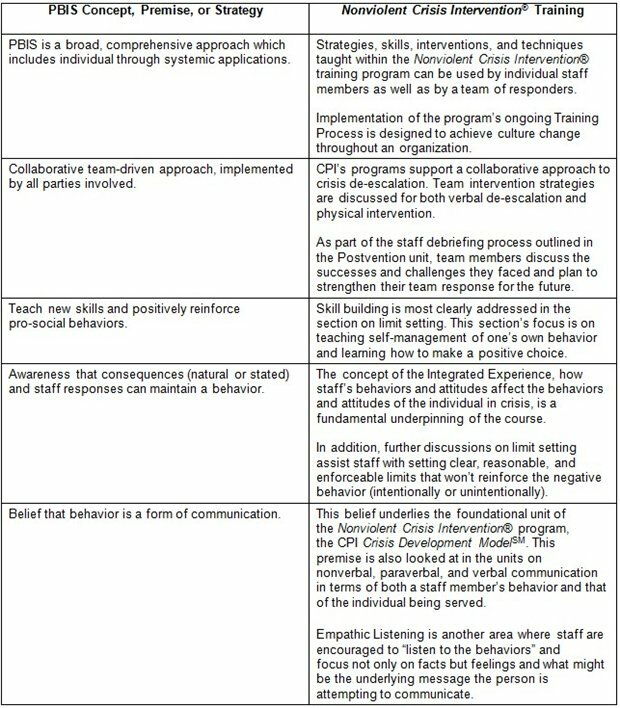 Figure 1 shows several PBIS concepts that align with techniques in the Nonviolent Crisis Intervention® training program. Recognizing this correlation as well as keeping methods consistent are powerful tools that aid both students and staff, reducing the risk of misunderstanding and confusion. A 25% decrease (approximate) in office-managed referrals for one high school in the district. Up to a 2% decrease in students needing higher level intense supports at secondary schools. 85–90% of students needing Tier 1/school-wide supports only in every school, and 10–13% of secondary level students needing Tier 2 and/or Tier 3 supports. Both of these numbers are heading in the right direction each year. While still working on Tier 1 practices, such success in this early stage has bolstered staff confidence overall, fostering the belief that the district will continue to progress strongly through Tiers 2 and 3 over the next few years. In fact, eight schools that have already started Tier 2 training will finish in December 2012. It is equally important not to lose sight of the foundation of these practices at any stage in the care continuum. “When someone’s talking about a kid running down the hall, you can’t just stop at ‘This kid is driving me crazy,’” O’Connor said. “You have to go back to the beginning—what happened a half hour ago? What happened when that kid was coming to school? Did he really learn the first time he was instructed not to run? We leave a lot of time [in training] for people to talk through scenarios. We can’t fix what happened, but we can learn from it.” Staff cannot afford to overlook the Precipitating Factors that can potentially affect how a situation begins as well as how staff respond to it. The Wauwatosa School District has enjoyed substantial success with its program. O’Connor applauds Wauwatosa’s unique position as a growing, heterogeneous suburb, at the same time recognizing that her own unique position fostered by her background and training allows her the necessary flexibility and freedom to benefit the district as a whole. A key method of reaffirming the tenets of PBIS across cultures is to state rules couched in simple, positive terms. Doing so creates a common ground for all students and staff. Positively-stated “do” rules help guide and reinforce appropriate behavior without giving undue focus to negative, “don’t” behaviors. 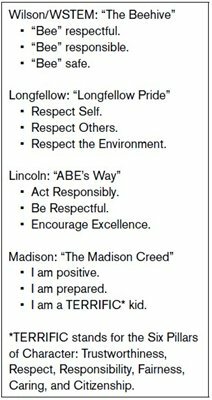 Each of the 13 schools in the district has posted its own rules relating to “Be Responsible, Be Respectful, Be Safe.” As Figure 2 shows, these messages can be conveyed in different ways while still presenting the core values of PBIS. “We still have signs up that say things such as ‘No Talking,’ said O’Connor, “but even those are starting to change. Our culture has gotten even stronger as we’ve reframed how we address issues. People are willing to give the practices a chance.” These practices have even filtered down through staff meetings that now have more effective agendas, increasing efficiency and problem-solving. The Wisconsin PBIS Network, a collaborative project funded by the Wisconsin Department of Public Instruction, has singled out four of the 13 Wauwatosa schools as “Schools of Distinction,” and two as “Schools of Merit,” for implementing PBIS. Hallmarks include scores related to leadership and implementation. O’Connor is delighted that this focus has helped foster the commitment to implement PBIS across the entire system as well as position Wauwatosa as a role model for PBIS efforts. As of the end of the 2011–2012 school year, all 13 schools have staff trained in both the Nonviolent Crisis Intervention® program and the implementation of PBIS. As human service providers, educators face challenging behavior and potentially dangerous situations every day. While not every incident can be avoided, how you respond to aggressive, disruptive, or assaultive behavior, and how you deal with your own stress, anxieties, and emotions, greatly determines the safety of everyone involved, and profoundly impacts the relationships with those in your care. As taught in Nonviolent Crisis Intervention® training, behaviors and crisis events do not occur in a vacuum (Rettmann, 2007). O’Connor acknowledges that collecting data is an ever-evolving process, especially when looking at something as varied as behaviors that disrupt learning. She finds it encouraging that behavioral modeling has suited Wauwatosa’s increasingly diverse population so well. Cirincione-Ulezi, N., & Jackson, A. (2012). Cultural competence in crisis intervention. Rettmann, R. D. (2007). Advancing safer schools: Physical safety—emotional security. Journal of Safe Management of Disruptive and Assaultive Behavior, XV(1), 1–2. CPI (2005). Instructor manual for the Nonviolent Crisis Intervention® training program. Milwaukee, WI: Author.